These two maps make interesting comparisons as it they show the contrast between the 18th century impressionism for landscape by using lumps to indicate hills, and a fairly soft touch to the road lines - as opposed to the very sharp defined lines of the 19th century mapmakers. 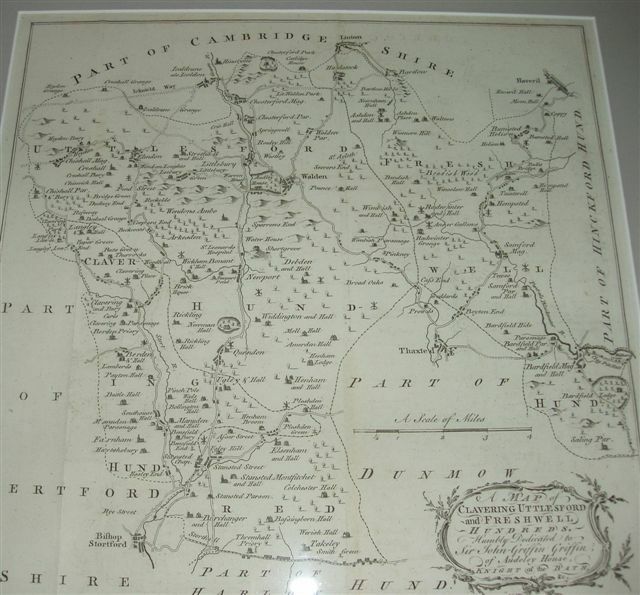 The first map is kindly loaned by Peter Walker, whose particular hobby is studying and collecting old maps of Essex. 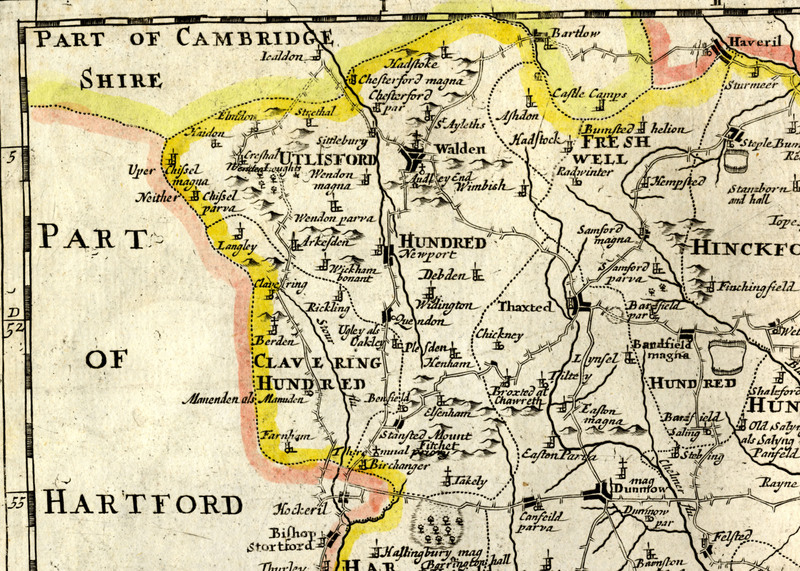 This map shows the old Hundreds of Uttlesford, Clavering and Freshwell as used in the Philip Morant History of Essex, and was created by Emanuel Bowen in 1768.The map was dedicated to Sir John Griffin Griffin of Audley End House. 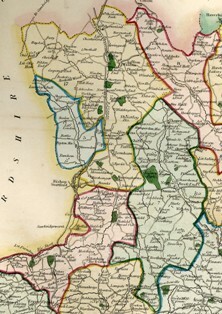 The second map is extracted from Thomas Wright’s A History and Topography of the County of Essex published in two volumes in 1836. This shows most of the area now covered by the Recorders of Uttlesford. The modern district of Uttlesford did not, of course, exist then, so the divisions shown are the old hundred boundaries which are not respected by the modern Uttlesford boundary, which today covers parts of several hundreds. Thomas Wright (1810-77) was an undergraduate at Cambridge when he was commissioned by George Virtue to edit and write a history of Essex. It is thought that he actually only visited the county twice! Nevertheless, according to a present-day historian Ken Neale, Wright ‘produced a highly literate, reliable and substantial two-volume account’. To some extent it is a re-hash of Philip Morant’s more famous History of Essex but, as Ken Neale says, ‘it was uncommonly well done, stands the test of time and is much more affordable than the now extremely valuable Morant originals’ (references from ‘Historians of Essex’ by Kenneth Neale, Saffron Walden Historical Journal, No 12 (Autumn 2006), p6). 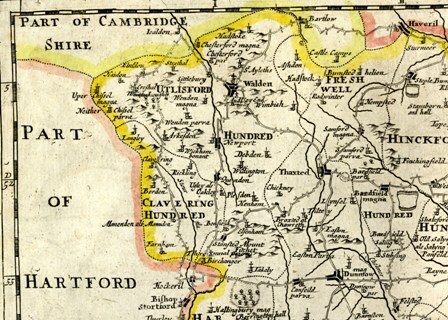 On the 18th century map, the words Magna and Parva are used instead of Great and Little as applied to Chesterford, etc and various spellings are different, eg Duddenhoe End is Dudney End, Wenden Lofts is Wenden Loughts. There are interesting features shown, such as St Leonard’s Hospital at Newport, a number of windmills and the old deer parks at Little Walden and Langley. 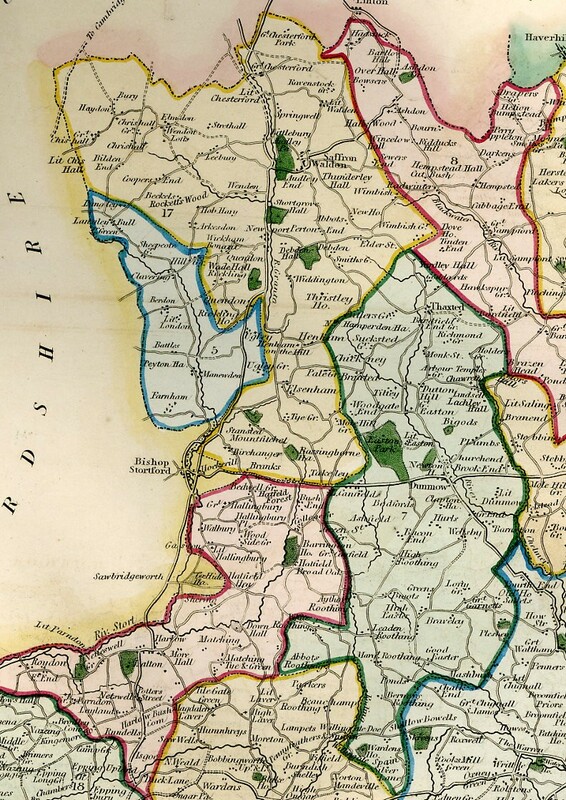 On the 19th century map, too, spellings were different – WickhamBonant is now Wicken Bonhunt, Berdon is now Berden, Manewden is now Manuden, the Roothings (the southern limit of modern Uttlesford) are now the Rodings. On both maps, some places such as Haydon (now spelt Heydon) and Great Chishill are no longer in Essex, but in Cambridgeshire. Peter Walker considers that the 1768 map, created by Bingley, is reasonably accurate - everything that tried to show detail after Chapman & Andre of 1773 generally is good. Bingley was making use of the Ordnance Survey by then, and the OS made use of the Chapman & Andre.The Bowen map was made before Chapman & Andre, but uses a map of 1724 by Warburton which is very good – Warburton’s was the first detailed accurate map of Essex, and Bowen used that in the Large English Atlas, which was used by C&A which was used by the OS, etc. This copy of the map is in much better condition than the one held by the ERO, so we are very grateful for Peter Walker for sharing it with the Recorder’s website. Please remember to acknowledge the source when using the map. Map historian Peter Walker tells us that this map dated 1722 is taken from Camden's Britannia, which was first published in 1586, and from 1607 it contained county maps (based on Saxton). The book was re-published in several editions over 200 years, the last one being in 1806. A major new edition with text by Gibson was published in 1695 used maps from Robert Morden, and these continued to be used in the re-issues of 1722, 30, 53 and 72; the Morden maps were not replaced until the Cary maps in 1789. 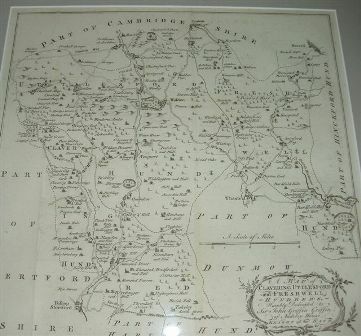 The map of Essex was based on Ogilby & Morgan's 1678 map, and was essentially unchanged in the later editions. It includes roads - albeit a bit schematically in places - and has most of the major features in the right places relative to each other. There are lines of longitude, using St Paul's London as the prime meridian, and three scales - of great, middle and small miles (the last being approx 1,760 yards). As such it is an improvement over the Saxton and Saxton-derived maps of the preceding 100 years, but is not very neatly drawn, nor is it very attractive compared to those being produced in the Netherlands. It would be superseded for accuracy and design in the 18th century by the Warburton map, which formed the basis of maps for the rest of that century.